With the Tour of Flanders on Sunday, there’s a ton of armchair quarterbacks throwing out choices for the top podium spot. Your friend “Chad” who lives in the basement and trains all day will certainly make his voice be heard, but what about the guys who have seen it all? They’ve witnessed countless Classics, spoken to the champions one-on-one, and have been a part of the coverage and landscape for decades. We asked two of our own legends JAMES STARTT and JOHN WILCOCKSON to give us some picks and some “backup” for their choices. The word in the peloton is that the 28-year-old Naesen, the reigning Belgian national champion, is simply flying and right now is likely one of the peloton’s top three strongest riders, something that he proved handily with podium finishes in both Milan–San Remo and Ghent–Wevelgem. Not only is he strong, but he also proved in both races that he has a rock-solid sprint to boot. Last year, he won the Bretagne Classic, a French WorldTour race, thanks to out-sprinting his two breakaway companions, Michael Valgren and Tim Wellens. He has yet to win a major classic—and needs to soon! He won here two years ago and he too has shown amazing form all year long. While the Deceuninck-Quick Step team may not have an overwhelming favorite this year, it boasts incredible depth and often it is the rider on the team that gets clear first that stays away—because the team is literally capable of shutting down the race behind. Gilbert has already proven he can go long, but some still argue that he benefited in his 2017 victory from the spectacular crash by Peter Sagan in the final kilometers. What better way for the 36-year-old Gilbert to put the skeptics to rest than with another Flanders win? The three-time world cyclocross champion, 33, finally seems to have moved into the role of leader on Belgium’s mighty Deceuninck-Quick Step team. And Stybar has proven already this year that he has what it takes to win big classics, having scored victory in key warm-up races like Omloop Het Nieuwsblad and the E3 Classic. He dances on the cobbles, is plenty fast in a sprint and is backed by one of the best classics team in the sport’s history. What is there not to like about his chances? Will it be lucky No. 13 for the reigning Olympic road champion? Van Avermaet, 33, has started Flanders 12 times, with best finishes of second (twice), third, fourth, fifth, seventh and eighth. He has not had the best team support so far this year, but his podium finishes at Het Nieuwsblad and E3 show that he’s not far from his best form. 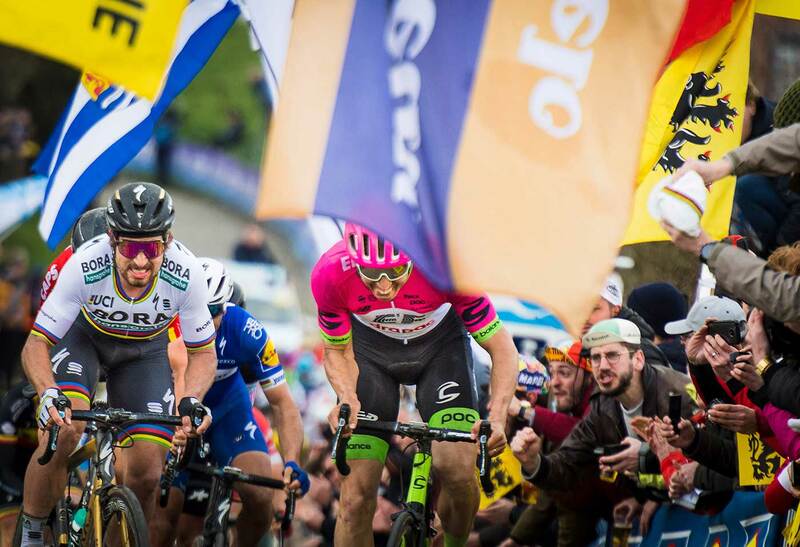 He excels at the longer distances of the monuments, and this weekend’s Flanders could well see both Van Avermaet and Bora-Hansgrohe’s “forgotten” Peter Sagan repeating one of their previous duels.